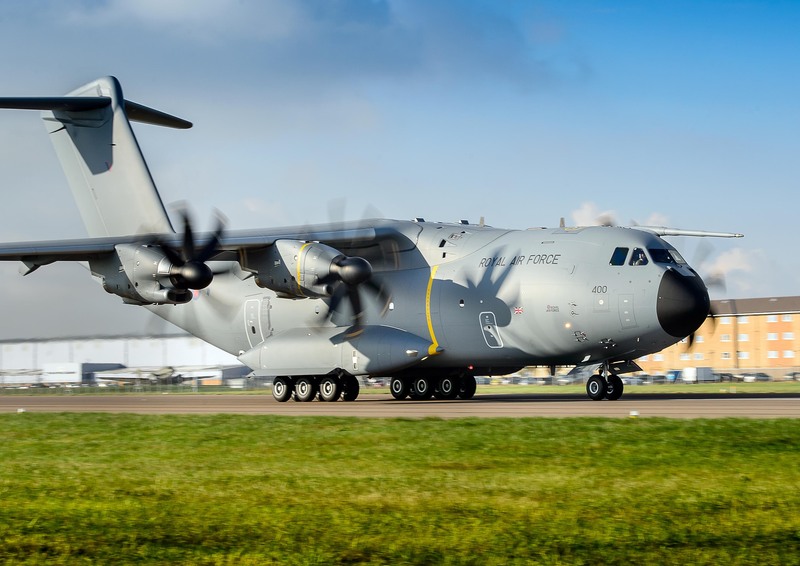 We completed the structure of a new hangar at RAF Brize Norton to house the RAF’s new A400M transport aircraft while they undergo maintenance and repairs. 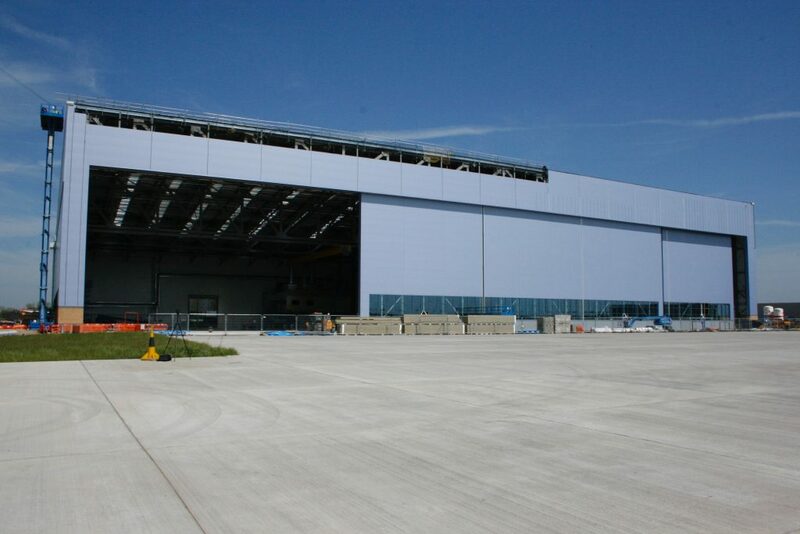 The hangar can hold three A400M aircraft at once, each of which has a wingspan of more than 42 metres. It features three separate bays, a three-storey office block, a ground equipment store and engine and tyre bays. The structure covers 24,000m­2 and is 28 metres high at its highest point. Following completion, the hangar was handed over to our colleagues in Defence Equipment and Support (DE&S) who are undertaking the internal fit-out before the finished building is handed over to the RAF in 2017. Also for the RAF, we’ve resurfaced the runway in Gibraltar. We’ve also been progressing work to prepare RAF Marham for the new F-35B Lightning fighters jets. Some old facilities were demolished using a cutting-edge chemical process. A £27m contract was awarded at the beginning of the month to build a new Squadron Headquarters. 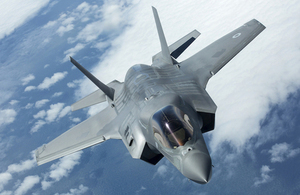 The F-35B is the most advanced aircraft ever built for the UK and will be based both at RAF Marham and on the Royal Navy’s new aircraft carriers, HMS Queen Elizabeth and HMS Prince of Wales. 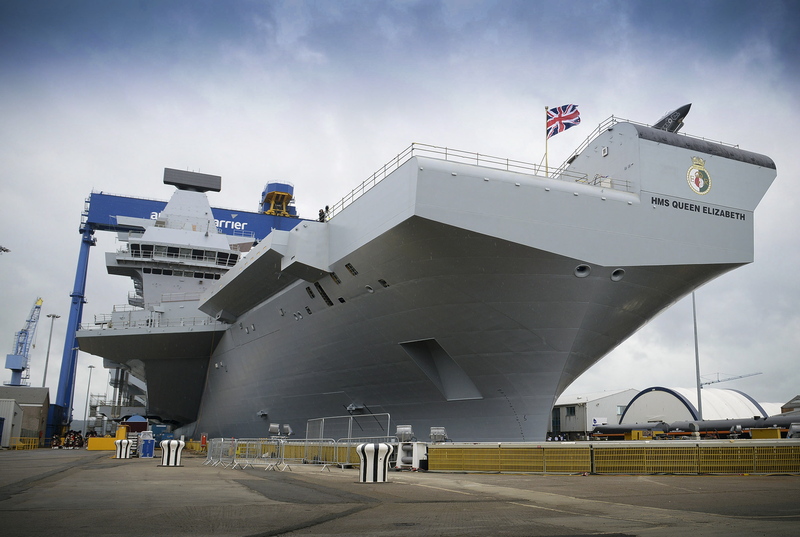 Speaking of the aircraft carriers, our team in Portsmouth has nearly finished work to ready HMNB Portsmouth for the arrival of HMS Queen Elizabeth early next year, which will be followed in due course by HMS Prince of Wales. The harbour is being dredged to ensure that it is deep enough for the ships, the largest the Royal Navy has ever operated. We’re renovating the jetty and have built a substation to convert electricity from the National Grid to power the ships. We’ve also installed navigation lights on the approach to the harbour. 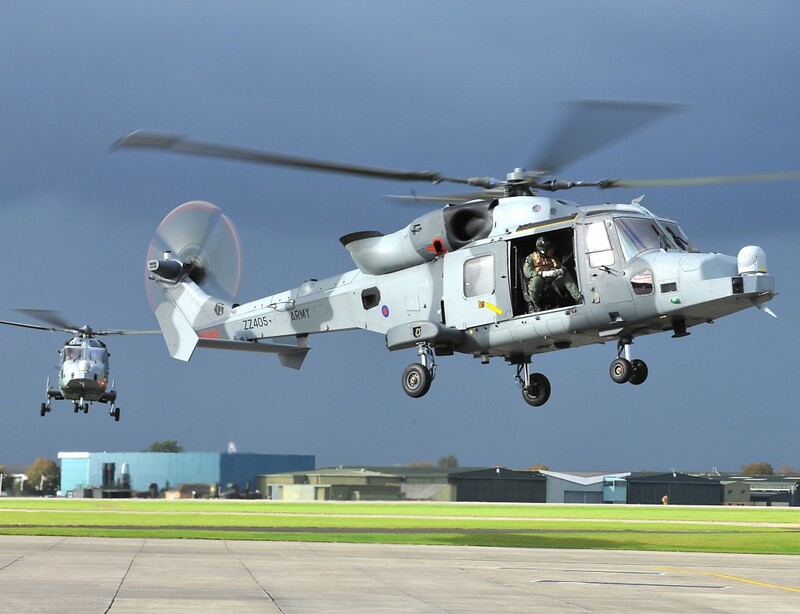 Work to ready RNAS Yeovilton to be the base for Wildcat helicopters belonging to both the Royal Navy and the Army Air Corps continues apace – look out for more on that on the blog in the next few weeks. New accommodation at Longbridge in Birmingham is underway to house defence medical personnel working at the Royal College of Defence Medicine, which will improve their quality of life by providing accommodation close to their workplace and surrounded by amenities. 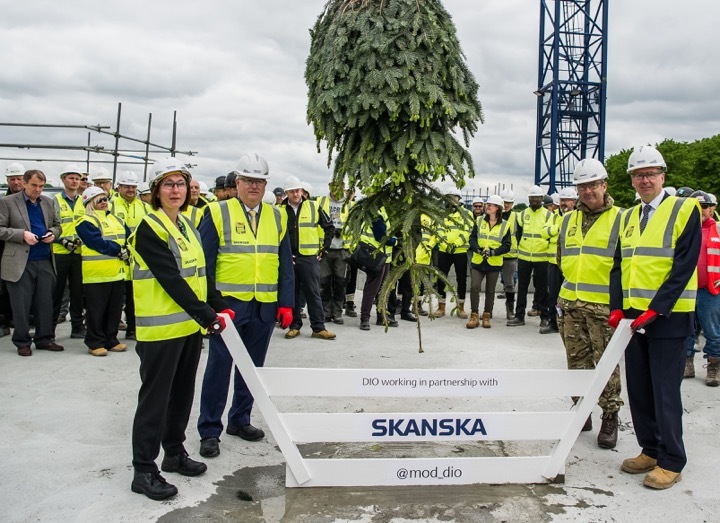 The Defence College of Logistics, Policing and Administration celebrated its ‘topping out’ back in May as the main college building reached its highest point. Our contactors Skanska celebrated with a Swedish tradition of hanging a fir tree over the building. The college will train personnel from all three services in policing, HR, transport, catering and supply functions. The 'topping out' ceremony for the main College building. 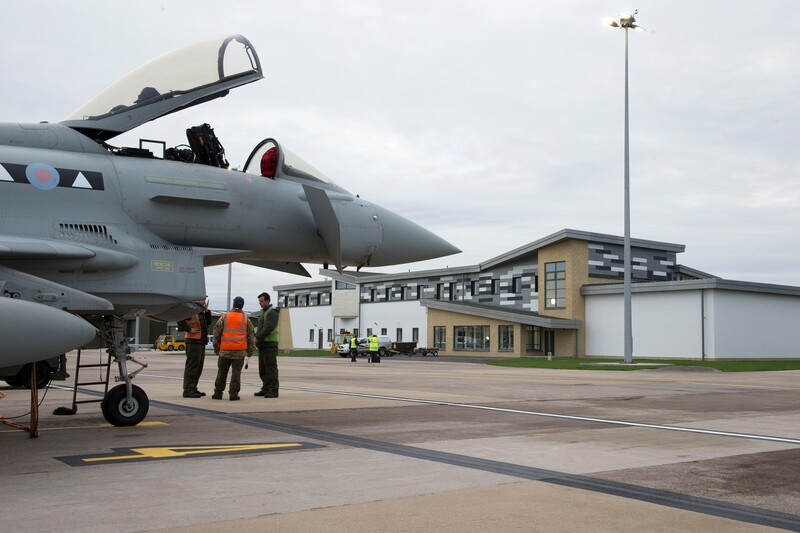 A £23m project to provide new facilities for Typhoons and their pilots and ground crew at RAF Lossiemouth was completed ahead of schedule. This was particularly important as the Typhoons at RAF Lossiemouth provide the UK’s Quick Reaction Alert (North) capability, responding to possible threats in the air. The project also won the Energy award at the Sanctuary Awards earlier this month. A Typhoon outside some of the new facilities at RAF Lossiemouth. We’re reducing the size of the Defence built estate by 30% to make it more efficient and reinvesting the proceeds into existing assets to make them better. 91 sites which are surplus to requirements have been identified by the Army, Royal Navy and Royal Air Force and now DIO is working to bring them to market. DIO also gained a new Chief Executive this year. Graham Dalton joined us with plenty of infrastructure experience including seven years as Chief Executive of the Highways Agency. Graham has only been with us since October, but you can read his early reflections on his blog. This is just a taster of what DIO’s been up to this year. Work continues for our staff supporting military training, providing accommodation and utilities, looking after the estate and in every other area of DIO’s vital work. There’s more to come in 2017 so stay tuned!